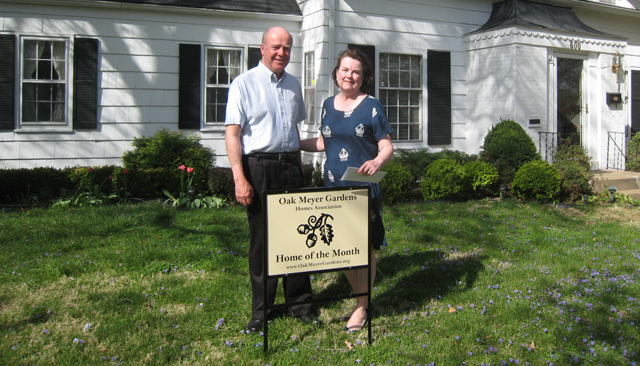 Starting this spring, our homes association will recognize some of our neighbors with the presentation of the new Home of the Month award. The award will be presented monthly, April through October, and will recognize residents who take exceptional pride in the outward appearance of their homes and property. Monthly winners will be announced in future newsletters and on our website. Along with neighborhood recognition, award winners in 2011 will be presented with a $25 gift card donated by our award sponsor, Euston Hardware, located at 126 W. 75th St.
Our inaugural Home of the Month award goes to Maurice and Jane Carey at 600 East 65th Terrace. Jane has lived in the home for over 30 years, and we appreciate the effort she and Maurice have made over the years maintaining their home and property. Would you like to nominate someone for home of the Month? Contact Oak Meyer gardens board member Christie Makar at (816) 361-7111 to make a suggestion.